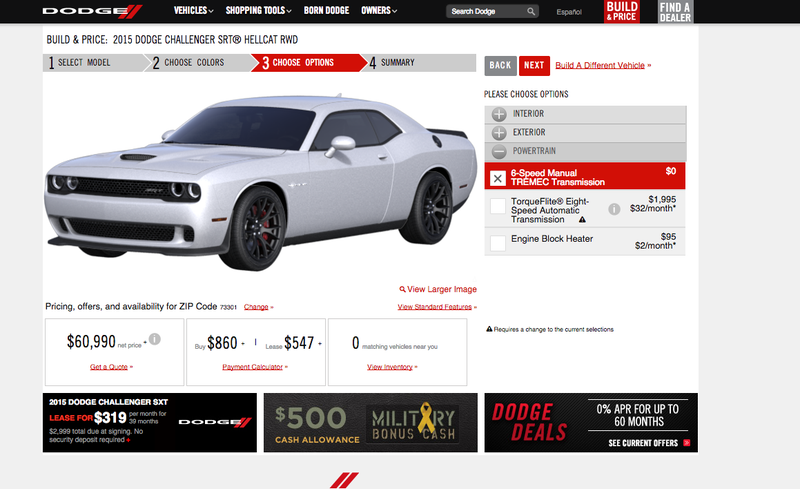 The Dodge Challenger SRT Hellcat configurator is finally online. Get in there, option out your Hellcat, and show us what yours would look like. FOR AMERICA. But unlike other "how you'd configure your car" features we've done, like the BMW M3/M4 and Porsche 911, the Challenger Hellcat doesn't have a ton of options. It's basically just exterior color, interior color, and transmission. And that's about it. What the Hellcat does have is a surprising amount of standard features, like a Bilstein active suspension, UConnect with an 8.4-inch screen, a year of satellite radio, leather and Alcantara bucket seats, and a lot more. I made mine white, Because Vanishing Point, with a black interior and a manual gearbox. It came in at $60,990. That's an insane deal for 707 horsepower. The configurator can be found on SRT's site here. Check it out and show us how you'd do yours.